There are several ways to increase your contact base for email marketing. The most common is through a button that is usually located on the right or left side of a website’s homepage but one of the most effective is using an online chat. Since it is an online service available in real time, online chat can perform various functions besides just supporting a visitor or client. It can also be used to gain leads and even increase the value of your sales, among other things. Along with the email finding tools, you can also create email marketing list with live chat. Here are 5 ways online chat can help you to increase your email list that you can start testing right now! When your operator team is busy and the visitor is forced to wait, it is possible to present a form before the service begins. This form can be a momentary distraction, preventing the visitor from giving up waiting and exiting this page. However, its main purpose is the possibility of getting leads through it. To do this, just make sure the form has at least the Name and Email options. This will cause the visitor to be forwarded to your contact base, increasing your email base without having to take any type of action. Proactive invitations are becoming a standard in online chat and its success is not in vain. According to a survey by Forrester, virtual stores that use proactive chat have a 105% return on investment (ROI), while those that don’t use it have only 15%. And they’re also great for converting visitors into leads. This type of functionality can be set up in several situations. For example, you can schedule an automated message that is sent to all visitors who spend a certain amount of time on your site. You can also set up another message if a visitor visits a particular page, for example. If you use proactive chat for the purpose of increasing your email list, you can set up a message suggesting the visitor to enter their email address in order to receive your newsletter on your content pages – such as blog posts. The use of pre-chat form and proactive invitations are structured to conditional triggers. That is, it is necessary that the visitor takes a certain measure so that you can use the tools, which will not always be done. Therefore, it is important to train your operators to always request the email address. Your attendants should be perfectly capable of conducting a conversation in a way that becomes natural to request the email address. It is worth remembering that simply asking for the email without any purpose can have an inverse effect. This tip should be considered for after getting the email contact. Even though most online chat platforms save these contacts, ideally you should integrate your chat service with your business CRM. So, every captured lead is automatically sent to your CRM as well, saving you the time and manual labor you would need to update the system. Even if your operators are not online, it is still possible to increase your mailing list. 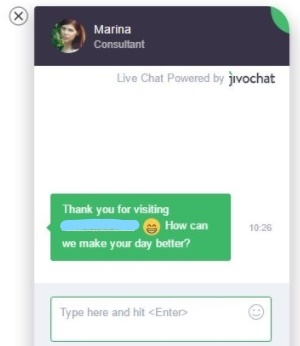 Online chat tools like JivoChat offer the option of creating offline forms, where a visitor leaves their contact information – including email address – and their message, which will be received by your team as soon as they are online again. When starting a new day, simply check how many new emails have appeared on your list.